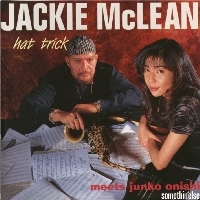 Living jazz legend Jackie McLean, age 63 in January 1996, decided to record his first leader album in four years on the Japanese label Somethin' Else. That in itself was great news, but that he decided to collaborate with Junko Onishi--a phenomenal jazz pianist who was having a meteoric rise at the time--was almost too much for Japanese jazz fans. Supported by a fantastic rhythm section of Nat Reeves and Lewis Nash, McLean and Onishi collided with immense force and created superb music that is hard-driving and passionate. Highlights abound, from McLean revisiting his old hits like "Little Melonae, " "Sentimental Journey" and "Bluesnik" to Onishi's excellent original "Jackie's Hat." Engineered by Jim Anderson, the sound quality is also very good. This is definitely one of the best albums released by Somethin' Else, a towering achievement, a crown jewel. Enthusiastically recommended! Recorded at Power Station Studio, NYC on January 28-31, 1996. SHM-CD uses an advanced polycarbonate material for superior sound quality and is compatible with all CD players.